The Commonwealth of Learning (COL) is an intergovernmental organisation established by the Commonwealth Heads of Government in 1988 to encourage the development and sharing of open learning and distance education knowledge, resources and technologies. COL is hosted in Canada by the Government of Canada. The major voluntary contributors – currently Australia, Canada, India, New Zealand, Nigeria, South Africa and the United Kingdom – are each entitled to seats on COL’s Board of Governors. COL works in close association with Commonwealth governments and local institutions and agencies, operating through a wide range of partnerships undertaken in a spirit of equality and participation. It seeks to create mutually beneficial linkages, especially of a South-South character, among Commonwealth countries. COL and the Commonwealth Secretariat’s Social Transformation Programmes Division work together closely to ensure that requests from governments for assistance are addressed in a prompt and effective manner. They also maintain effective links with Commonwealth associations (e.g., the Association of Commonwealth Universities) and non-governmental organisations (such as the Commonwealth Consortium for Education) for the same purpose. COL and the Commonwealth Secretariat are specifically harmonising their work in teacher education, health, respect and understanding (Civil Paths to Peace) and the Virtual University for Small States of the Commonwealth (VUSSC). COL’s expertise and experience in distance education and educational technologies is particularly useful. COL is also working with the Commonwealth Foundation and UNESCO. COL has strong networks of partners in its various areas of activity. In education, these include the Commonwealth’s distance teaching universities, open schools, and regional centres for distance education such as, in Africa, the Regional Training and Research Institute for Distance and Open Learning (RETRIDOL) and SADC Distance Education Centre (SADC-CDE). COL’s regional agency, the Commonwealth Educational Media Centre for Asia (CEMCA), was established in 1994 to promote cooperation and collaboration in the use of electronic media resources for distance education. CEMCA is particularly active in supporting the expansion of community radio in India and other Commonwealth Asian countries. UNESCO-COL chairs – distinguished academics who serve in an honorary capacity, complementing the political and administrative role of the focal points and honorary advisers. In addition, COL also sustains links with non-governmental organisations (NGOs) in many countries and has an important relationship with the William and Flora Hewlett Foundation for developing the use of open educational resources (OER). COL helps governments to expand the scale, efficiency and quality of learning by using appropriate technologies, particularly those that support ODL. A substantial and equitable increase in the number of Commonwealth citizens acquiring the knowledge and skills for leading productive and healthy lives, through formal and nonformal open and distance learning opportunities. The theme of COL’s new three-year plan (2012-2015) remains Learning for Development. This plan extends to 2015, the target date set for the achievement of a number of the Millennium Development Goals (MDGs). COL uses the internationally agreed MDGs, the Education for All (EFA) goals and the Commonwealth priorities of peace, democracy, equality and the rule of law as its framework for action. The emphasis in this three-year plan is on skills development,the education of girls and women, and promoting the use of OER. The plan has three strategic goals, as outlined below. Quality education for all Commonwealth citizens: increased access to affordable primary, secondary and tertiary education, especially for girls, women and the marginalised. Human resources development in the Commonwealth: sustainable and replicable learning systems in place for farming, health and skills development in the formal and informal sectors. Harnessing ODL and technologies to achieve development goals: improved capacity of governments and civil society to provide quality learning for achieving MDG and EFA goals. COL’s work is focused on seven initiatives in two programme sectors. The Education sector includes open schooling, teacher education, higher education and VUSSC. Under Livelihoods and Health, there are three initiatives: technical and vocational skills development, lifelong learning for farmers, and healthy communities. Each sector pursues its aims through five core strategies, namely, partnerships, models, policies, capacity and materials. In practice, most COL activities incorporate more than one of these strategies and, in some cases, all five. Gender and elearning are cross-cutting themes that underpin and complement all seven initiatives. The Education sector focuses on capacity-building, models and materials development, and supporting quality assurance. There are four Education programme initiatives: Open Schooling, Teacher Education, Higher Education, and VUSSC. Open schools are increasingly recognised as a solution to the growing demand for secondary school education in developing countries. As primary school enrolments grow due to successful efforts to meet the United Nations Millennium Development Goal of Universal Primary Education, many nations are unable to accommodate the corresponding increase in potential secondary school students. Open Schooling offers a viable solution to the lack of qualified teachers and conventional schools in the developing world. The ‘open’ in Open Schooling refers to the openness of the system; usually there are no rules dictating student ages, prerequisites, content of courses or number of courses in which learners must enrol. As a result, Open Schooling meets the needs of a broad range of learners including people who missed out on schooling in their childhood, young mothers, working adults, and people of all ages who want to acquire new skills and knowledge to improve their livelihoods. COL is helping to increase access to quality education while increasing student achievement by providing teachers in developing countries with new technologies, tools and skills. COL’s Open Schooling initiatives include the following. Advocacy: COL works with partners in government, nongovernmental organisations and education institutions to promote Open Schooling. Development of open schools: COL has helped develop policies and proposals for the establishment of open schools in Cameroon, Ghana, Nigeria, Pakistan, Trinidad and Tobago, and United Republic of Tanzania. Capacity-building: COL works with partners to train educators, administrators and policy-makers in the development and operation of open schools. Workshops have focused on materials development, instructional design, radio broadcasting, learner support, e-learning, management of open schools, strategic planning for open schools and quality assurance. Fostering collaboration: COL led ‘OER for Open Schools’, a multi-year pan-Commonwealth programme funded in part by the William and Flora Hewlett Foundation that built capacity in developing OER in six Commonwealth countries. This resulted in the creation of a repository of freely available course materials for 20 subjects at Grade 10 level. Publications: COL has published research, handbooks and guides to support open schools on subjects such as costs and financing, gender-sensitive information and communication technology (ICT) strategy, mobile technologies and learner support. Learning materials: COL has assisted with the development of quality learning materials for open schools. Quality assurance: COL provides training in quality assurance and developed a QA Toolkit for open schools. Recognising that shortfalls in teacher supply cannot be addressed through conventional face-to-face training, almost all Commonwealth countries are investing in ODL for teacher training. COL helps developing countries to build the capacity of their teacher training systems so that they adequately address the shortfalls in teacher supply and also enhance teachers’ quality, performance and effectiveness. Working in partnership with teacher training institutions, governments and other international agencies, COL is currently spearheading several major Teacher Education initiatives, outlined below. OER for English Language Teaching (OERELT): the OERELT initiative brought together ministries of education, schools and teacher training institutions from across the Commonwealth to develop a bank of open-content, multimedia, English-language resources in online and traditional text formats to support school-based education. ‘Master Teachers’ are being trained in several countries to support the introduction and adoption of these freely available learning resources. Child-Friendly Schools: through a partnership with the United Nations Children’s Fund (UNICEF), COL promoted quality in education through the ‘Child-Friendly Schools’ model. COL worked with partner institutions and ministries of education in ten countries – Botswana, Lesotho, Malawi, Nigeria, Rwanda, South Africa, Sri Lanka, Swaziland, Trinidad and Tobago, and Zambia – to create learning resources and introduce Child Friendly Schools to teacher training institutions and teacher resource centres. Dissemination of TESSA OER (Uganda and Zambia): Teacher Education in Sub-Saharan Africa (TESSA) is a consortium of 18 organisations, including COL that is collaborating to develop extensive multilingual OER for teacher training. COL and TESSA formed an additional partnership to promote the dissemination and use of TESSA resources by primary school teachers and teacher educators in Uganda and Zambia. Strengthening partnerships: COL regularly participates in international meetings to further co-operate on Teacher Education initiatives. Representatives from COL and UNESCO met in February 2012 with partners from seven Commonwealth countries at a Partners’ Consultative Meeting on Teacher Education in Paris, France. Quality assurance: COL collaborated with the National Assessment and Accreditation Council (NAAC) in India and 18 teacher training institutions in the Commonwealth to develop a Quality Assurance Toolkit for Teacher Education. The toolkit helps teacher training institutions conduct internal assessments and enhance the quality of their programmes. It is freely available for download. Most governments in the Commonwealth aim to enhance access to higher education. This can be achieved through the increased use of quality ODL provision. COL’s work in higher education is geared towards ensuring greater access, better systems, more effective and efficient institutional management, and quality teaching and learning. supporting quality assurance. The COL Review and Improvement Model (COL RIM) offers higher education institutions with the tools to conduct a cost-effective institutional quality audit. This ‘do-it-yourself’ approach to quality assurance monitoring and evaluation is freely available and has been implemented in ten higher education institutions in six Commonwealth countries. COL is also building capacity through its Commonwealth Executive Master of Business Administration and Public Administration (CEMBA/CEMPA) programmes and postgraduate diploma programme in Legislative Drafting, available at partner universities throughout the Commonwealth. VUSSC is a network of 32 small states of the Commonwealth committed to the collaborative development of open content resources for education, capacity-building and the use of ICT to broaden access to education. VUSSC is led by a management committee of representatives from small states in all regions of the Commonwealth, supported by COL. It is focusing on creating skills-related post-secondary courses in areas such as tourism, entrepreneurship, professional development, disaster management, and a range of technical and vocational subjects. These non-proprietary, electronically held course materials – developed by small states, for small states – can readily be adapted to the specific context of each country. Small states thus become active contributors to global development and leaders in educational reform through the innovative use of ICT. COL is building capacity in online materials development among educators in small states of the Commonwealth by hosting intensive training workshops or ‘boot camps’. Educators from small states learn computer literacy skills and how to collaboratively develop learning materials. Upon return to their home countries, workshop participants continue to collaborate on course materials and share their skills with colleagues. VUSSC’s Transnational Qualifications Framework (TQF) is a system of accreditation for VUSSC courses that facilitates the movement of courses and learners among countries. The TQF ensures that all OER created for VUSSC can be adapted into recognised courses that students can take for credit through educational institutions in small states. VUSSC’s online learning portal, freely available to all VUSSC participating institutions, offers free online materials and resources for learners and educators. The site features the Moodle Learning Management System, which enables educators to collaborate on the development of online courses. The Livelihoods and Health sector aims to improve the income, livelihoods and quality of life of communities through new knowledge and skills gained through ODL. There are three programme initiatives in this sector: Technical and Vocational Skills Development, Learning for Farming, and Healthy Communities. support the development of new learning materials and repurposing OER. COL is working in partnership with the Commonwealth Association of Polytechnics in Africa (CAPA) to expand flexible and blended delivery approaches in TVET in Africa. COL and CAPA are spearheading Flexible Skills Development training workshops, policy development and an online Community Learning Network, all aimed at alleviating poverty by increasing access to quality skills development. COL has commissioned research about expanding flexible approaches to TVET in the Pacific and is working with partners to expand skills development efforts in that region. Lifelong Learning for Farmers (L3 Farmers) demonstrates COL’s ability to partner with communities and organisations, and make effective use of ICT to facilitate learning for development. COL’s L3 Farmers programme helps people in rural communities to find appropriate technology-based open and distance education to improve their livelihoods. The programme is a response to a critical need: the wealth of information resulting from agricultural research and development often fails to travel the last mile to the villages of the developing world where it is most needed. While governments face challenges in funding adequate agricultural extension, globalisation is creating increasing competition for poor rural farmers. L3 Farmers is based on a web of partnerships that brings together farmers, research/educational institutions, ICT providers and banks. In collaboration with partners, resource-poor farming communities use ODL to increase their knowledge and skills to access new information, training and financing that improve their livelihoods through various economic activities. The various stakeholders are active participants in a win-win situation. L3 Farmers was introduced in four villages in southern India in 2004. In one district, C$2.5 million in assets and income was generated by 2,000 women participating in L3 Farmers. Livelihoods are improving significantly as previously marginalised people create profitable farming enterprises. In recent years, COL has overseen expansion of the programme to Jamaica, Kenya, Mauritius, Papua New Guinea, Sri Lanka and Uganda. Increasingly, mobile phones are used to disseminate information and knowledge. Farmers access learning through daily audio messages. L3 Farmers is using the Learning through Interactive Voice Education Systems (LIVES) system to reach thousands of farmers in India and Jamaica. The Healthy Communities initiative uses ODL to expand learning opportunities about community health and development in nonformal settings. COL promotes a distinctive community learning model based on collaboration among community networks, public authorities and media/ICT groups. COL aims to increase access to appropriate information, knowledge, learning materials and tools to enable better community responses to HIV/AIDS and other health and development challenges, particularly in remote and resource-poor areas. By encouraging participation by community members and other partners, COL facilitates effective learning and enables better responses to development challenges such as maternal and child health, and HIV/AIDS. • building research and evaluation into projects to ensure knowledge is shared and to foster the development of model practices and policies. The two most significant common themes underpinning all seven initiatives are e-learning and gender. COL’s work continues to raise levels of digital literacy and the ICT competencies of teachers by facilitating the creation of high-quality learning materials made available as OER. COL has been at the forefront of the OER movement, which promotes the creation, sharing and adaptation of learning materials that anyone can freely use for teaching, learning, development and research. It recently spearheaded an initiative to get governments worldwide to recognise officially the importance of sharing OER. ‘Fostering Governmental Support for OER Internationally’ involved consultation workshops in every region of the Commonwealth and a survey of governments worldwide, culminating in the presentation of the Paris Declaration at UNESCO’s World OER Congress in June 2012. The Paris Declaration is a commitment to making educational resources developed with public funds freely available for re-use and re-purposing under open licences. A previous COL-UNESCO collaboration, ‘Taking OER beyond the OER Community’, spread awareness of the value of open content, particularly among policy-makers and institutional managers. This led to the publication of numerous resources including ‘A Basic Guide to Open Educational Resources’ and ‘Guidelines for OER in Higher Education’. COL led a pan-Commonwealth collaboration, ‘OER for Open Schools’, which involved extensive training in ODL course materials development. Six open schools took part in the initiative, which resulted in the development of course materials in 20 subjects at the Grade 10 level. The materials are freely available as OER, providing both open schools and conventional schools with open access to quality learning materials. Gender is a cross-cutting corporate goal for COL; both women’s and men’s views, interests and needs shape its programmes. With an official Gender policy and a Gender Action Plan, COL has adopted gender mainstreaming as an organisational strategy. This involves identifying gender-specific activities and initiatives, as appropriate, when girls/women or boys/men are in a particularly disadvantageous position. A gender equality perspective is taken at all stages of the programme cycle – planning, implementation, monitoring and evaluation – to ensure that the initiatives offer equal opportunities, benefits and participation to girls/women and boys/men. being proactive in disseminating COL’s work on gender to stakeholders. COL’s website (www.col.org) offers a wealth of information related to gender including the following. COL’s Gender Micro-site, which has been designed to provide a one-stop comprehensive platform to access print and electronic resources on gender and ODL with a special emphasis on ICT. By providing knowledge and information on gender and ODL/ICT, COL seeks to raise awareness and provide tools to ODL policymakers and practitioners to help them address gender concerns in their areas of competence. The Gender Management System (GMS) Toolkit: An Integrated Resource for Implementing the Gender Management System Series, a print resource developed by COL with the Commonwealth Secretariat to help Commonwealth governments to mainstream gender issues into their decisionmaking and to support the work of those responsible for gender mainstreaming. ‘Boys’ Underachievement in Education: an exploration in selected Commonwealth countries’ and ‘The Gender Dimension of ODL’. The COL eLearning for International Organisations (eLIO) is a feefor service arrangement that responds to the capacity enhancement needs of international organisations. Recognising COL’s extensive technical experience and understanding of issues in the developing world, international organisations are increasingly turning to COL for their training needs. COL has developed customised e-learning programmes for the Commonwealth Secretariat, United Nations agencies, the World Bank and many other international agencies. Course subject matter ranges from effective communication and report writing to operational data management and debt management. Each course is tailored to the specific requirements of the contracting organisation so that learners can apply learning to their daily occupations. COL’s eLIO team has trained more than 7,000 learners in more than 130 countries since 2000. These training solutions use ODL to widen access to professional development opportunities, especially for female and junior workers based in field and country offices. Success rates exceed 80 per cent because of the effective combination of quality course materials and personalised delivery. 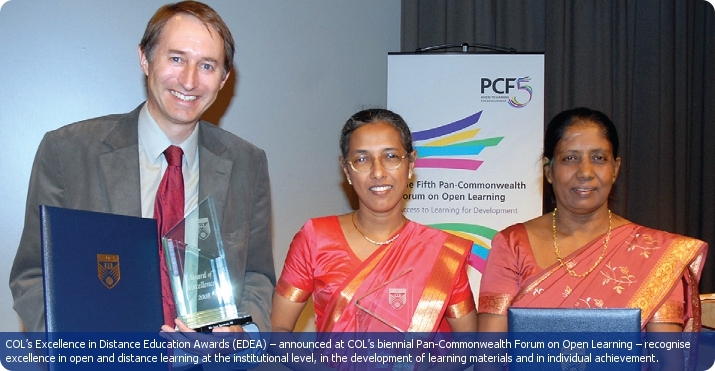 COL’s biennial Pan-Commonwealth Forum on Open Learning (PCF) has become one of the world’s top international conferences on learning and global development. The five-day programme is designed to address ODL’s role in widening educational access, bridging the digital divide, and advancing the social and economic development of communities and nations at large. Thanks to an active sponsorship programme and low registration fees, most participants come from developing countries. COL presents its Excellence in Distance Education Awards and confers Honorary Fellowships at each forum. PCF7 will be held in Abuja, Nigeria, in December 2013, co-hosted by the Federal Ministry of Education. The National Open University of Nigeria (NOUN) is the lead partner institution. COL employs a variety of media to communicate with stakeholders and the wider public. This includes increasing use of Web 2.0 technologies, taking advantage of opportunities for user interactivity through blogging, audio, video and RSS/news feeds and for engaging in popular social media sites. COL’s website offers a wide range of information resources (www.col.org/resources) including several online databases and knowledge retrieval services. The website also offers free access to an extensive collection of publications including studies, reports and research documents. COL’s newsletter, Connections, provides news about COL’s work and updates about ODL from around the globe. It is published three times annually and is available online at www.col.org/connections. COL’s online blog (www.col.org/blog) encourages interaction, discussion and knowledge sharing on issues related to learning for development. COL’s Information Resource Centre (www.col.org/irc) offers access to a wide range of publications, OER and news feeds, as well as extensive search tools. COL’s Resource CD-Rom is a collection of COL’s most popular resource publications, news and software. While most of the contents are also available in print or on www.col.org, the CD-Rom provides a convenient, fast-loading compilation of the ODL resources that COL has produced for public distribution and use. It is updated regularly and available on request at info@col.org.